8N 28″ rear wheel rims. 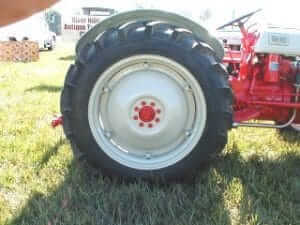 The wheel on the left is an original “box” or “hat” style rim while the wheel on the right is a common 6 loop replacement rim found on many tractors. Since a lot of the original rims were eaten up by calcium chloride leakage (used as ballast weight) finding good original rims today has become quite a challenge. 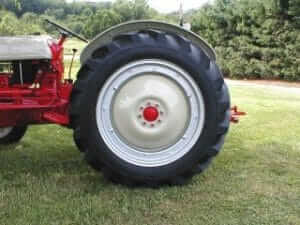 The original hat style rear rims were also made for Ford by Kelsey Hayes. If you can find one that isn’t rusted you can see the size, Ford logo and Kelsey Hayes name stamped on the inside of the rim.